Matrix introduces Sublative Rejuvenation, a revolutionary new skin treatment that reduces wrinkles, acne scars, stretch marks, discolorations, sun damage and textural irregularities while tightening skin all in one sitting. 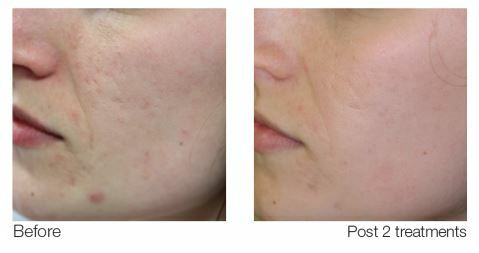 The process requires little to no downtime and is clinically proven for all skin types. The Sublative Rejuvenation treatment was first introduced in Summer of 2009 and has since been featured on national television shows such as The View, The Early Show, Dr. Phil and the Rachael Ray Show for its anti-aging and skin-smoothening results on patients of ALL skin types and colors. Sublative Rejuvenation using eMatrix is effective for treating skin of color. While previously patients with darker skin tones have had very limited options, eMatrix is able to reduce hard-to-get acne scars on skin of color. Doctors and dermatologists from across the country are praising eMatrix for its safe and effective treatment for patients of darker skin tones in the Hispanic, African-American, East Indian and Asian communities. Clinical studies have found that patients undergoing Sublative Rejuvenation have minimal discomfort, no permanent side effects and minimal downtime. A full face treatment takes less than 20 minutes. eMatrix differs from other fractional skin resurfacing in that is uses bi-polar radio frequency to penetrate through the skin – sending more energy beneath the surface of the skin to really maximize collagen production – while keeping the top layer of the skin intact. This is an important factor in why it’s safe for all skin types. Consult Dr. Barr at Palm Beach Plastic and Cosmetic Surgery to determine if eMatrix is right for you.